Thump-thump, thump-thump, thump-thump. What's that sound? Three weeks after fertilization, Baby Chris has reached a significant developmental milestone: his or her heart is beating! The embryonic heart is currently tube-shaped, but already performing the critical function of delivering nutrients throughout the body to allow continued growth. Baby Chris's heart will beat 54 million times before he or she is born. Last week, we mentioned that Baby Chris's body was beginning to divide into three sections known as germ layers: the endoderm, mesoderm, and ectoderm. That process, known as gastrulation, is now complete. The endoderm will become the liver, pancreas, bladder, digestive tract, and respiratory tract. The mesoderm is home to the heart, kidneys, bones, cartilage, muscles, and blood vessels. The ectoderm will become the brain, spinal cord, nerves, skin, nails, and hair. In the ectoderm, the nervous system is starting to take shape. 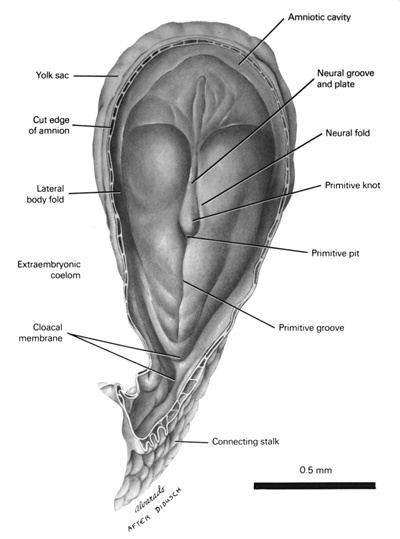 The neural tube sets the stage for the spinal cord, and three brain structures can be seen: the forebrain, midbrain, and hindbrain. Many pregnant mothers supplement their diets with folic acid, which has been shown to reduce the risk of neurological developmental problems. Don't forget: you can learn more about Baby Chris's 9-month journey by downloading the See Baby app on your smartphone!